On Pi(e) Day last week, my friend Katy shared this 1920s-era photo with me, via the National Archives's Today's Document. 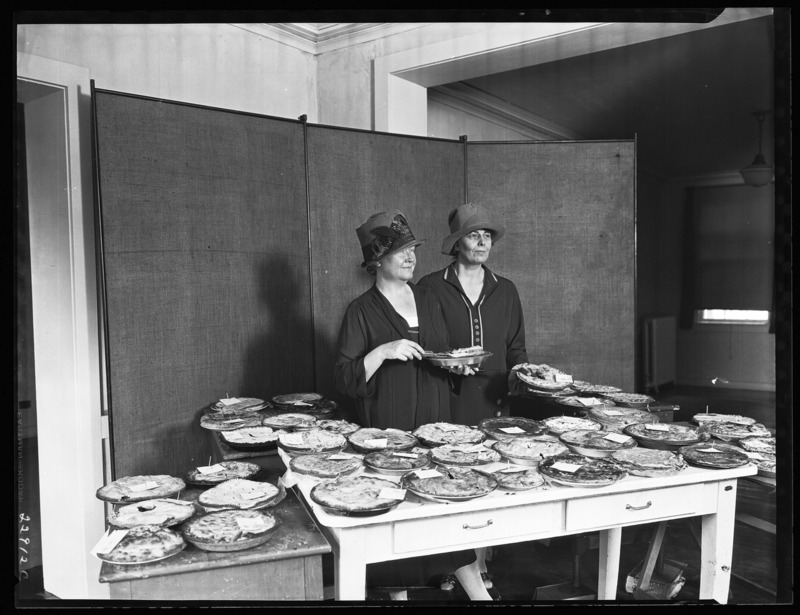 The caption says it's a pie judging contest with Dr. Louise Stanley and Mary Lindsay, from the series: Photographs of Nutrition Investigations, 1904 - 1939 from the Records of the Bureau of Human Nutrition and Home Economics, 1904 - 1939. Being interested in the history of the Home Economics movement, I had to know more. While I didn't find much more information about the photo, I did learn that Dr. Louise Stanley was a home economist from Tennessee and an inductee in the National Agricultural Hall of Fame (I didn't know there was such a thing!) for her efforts to establish Home Economics as a crucial aspect of agricultural education and politics. She held a B.S., a B.A., an M.A. and a Ph.D. and served as the Commissioner of the Department of Home Economics at the USDA. And she apparently held (or judged) pie contests. She sounds cool. If you're not familiar, Home Economics is much more than that middle school class where you learned how to make corned beef on toast and sew a gym bag (that's what we did). It was in fact, a post-WWI feminist movement that sought to bring value to women's domestic work and implement the field as an academic and scientific discipline. My best friend just created an exhibit on Home Economics for the Hull House Museum in Chicago, and wrote this piece about it here. Speaking of, she's coming to visit this weekend! We eat delicious food, have a Talking Heads dance party, work on some projects we have brewing, and probably bake a pie. Got any pie baking (or pie judging?) plans yourself this weekend?